Purchasing an ‘As Seen on TV’ item is often a gamble. These products are marketed as the next big thing and meant to solve our biggest everyday problems. Often, consumers end up paying too much for an item that provides them with less-than-stellar results. Yet, occasionally, we come across a product that works exactly as advertised. A reasonably priced product that really can help make our lives easier. The Simply Straight Ceramic Hair Straightening Brush is one of those products. What is Simply Straight and How Does It Work? What Makes Simply Straight Unique? The Simply Straight Ceramic Hair Straightener Brush is an electric, heated brush that will straighten all types of curly or wavy hair quickly and easily. You simply plug in the brush, turn it on, and adjust the temperature. Then allow the device to heat up the same as you would a standard straightener or curling iron. Once Simply Straight has reached the desired temperature, use it the same as you would any other brush. The heated ceramic bristles gently relax your hair with every pass, leaving you with soft and silky straight hair in a matter of seconds. Simply Straight can be used with various types of hair and it’s very easy to use. It features a fast, 2-minute heat up, and can reach temperatures up to 450 degrees Fahrenheit. It has a lightweight design and a 60-minute auto shut-off feature so no worries about accidently leaving it on. This product couldn’t be easier to use, and the best part is that it offers salon-quality results. Simply Straight is an affordable alternative to those expensive ceramic hair straighteners and it also costs much less than a trip to the salon. Simply Straight is an innovative hair styling tool that will save you both time and money. Are you the type of person who resorts to a dull hairstyle every day because you don’t have time to style it the way you would like? Using a standard hair straightener can be time-consuming, especially for those with very long or thick hair. However, with Simply Straight, you use it the same as you would your own hairbrush. It only takes a few minutes to heat up and you are ready to brush your uncontrollable hair and transform it into hair that is straight and soft to the touch. With Simply Straight, you eliminate the need to heat up an additional styling product. And you don’t have to spend time flattening out section after section. Just brush though your hair as usual and watch as it instantly becomes straight. The Simply Straight Ceramic Hair Straightener Brush is an affordable product that is worth every penny. Professional hair straighteners like those used by your hairdresser can cost hundreds of dollars. Even those that you can find at your area retail store can cost anywhere from $30 to $60 or more. The Simply Straight Brush costs around $29.99 whether you order from their official website or purchase one from a trusted retailer. It’s possible to find the hair straightener for even less if you shop around and find the item on sale. The product offers the same results as a straightener that costs three times as much, making it a remarkable value. Simply Straight is very easy to use, however if you have never used a straightening brush before you may want to know how it to use it ahead of time. Plug the brush in and turn it on using the power button the handle. Select the desired temperature and keep it low if you have thin or severely damaged hair. For thicker hair, increase the heat. Use a heat protection spray if desired and brush your hair thoroughly. Section your hair out and check that the brush has reached the desired temperature. A light will turn on when the straightener has reached the set temperature. Use the straightening brush over each section. To improve volume, lift the hair at the root first. Hair should straighten in just one pass. Repeat with each section and finish using your favorite styling product or hair serum. Most users comment on the same benefits and disadvantages of this product. Many Simply Straight owners can agree that it is a fast and effective way for busy individuals to straighten their hair. They like that it gets the job done all while reducing the amount of damage that they would endure from a traditional hair straightener. They also like how affordable the product is and how easy it is to use. As far as complaints go with this product, some claim to have unsatisfactory results after using it, with some areas of their hair left frizzy or not as straight as they anticipated. While it’s a great product for long, thick hair, it isn’t the best to use if you have short or thin hair. Most consumers who have used Simply Straight are pleased with the results. Users with thick hair who gave the product a try are overall surprised with how easily it works on their hair type. Here are some of the advantages and disadvantages that customers have noticed after using this product. After using the product, many people have said that they’ve noticed less damage to their hair than they had using a traditional hair straightener. That could be because the brush doesn’t get the hair as hot since it simply passes through and doesn’t clamp on to your locks. Practically everyone who has used the product is pleased with how this simple and affordable brush leaves their hair visibly straighter. While it may not be as straight as when you visit your local salon, it still works well for the price and the ease of use is a bonus. The Simply Straight Ceramic Hair Straightening Brush takes less time to straighten your hair than a standard flat iron. That’s because the brush is larger and can straighten sections of your hair in less time. If you always feel rushed in the morning and rarely have the chance to style your hair the way you want, this product will help you get the look you desire in less time. Even products that seem to work as well as Simply Straight will have some disadvantages. Here are a few examples of what users are unhappy with after using this product. Since the brush works differently than a traditional hair straightener, there are some results that will not be the same. If you have curly or textured hair, the areas that aren’t straightened may stand out. The product is marketed as a 2-in-1 styling tool, allowing you to use it as a basic hair brush and a straightener. But the truth is that it doesn’t work well as an everyday brush. That could be due to the size and weight that makes the product a little bulky, at least if you are trying to use it just to brush your hair. Once you have used the product for a while, there will be some building of oils and styling products form on the brush. With the strong and durable bristles, it can be difficult to clean effectively. There are several hair straightening products available today and many have taken on the same convenient brush design as Simply Straight. So how does this product stack up to all the others? The Dafni Straightening Brush looks very similar to the Simply Straight. 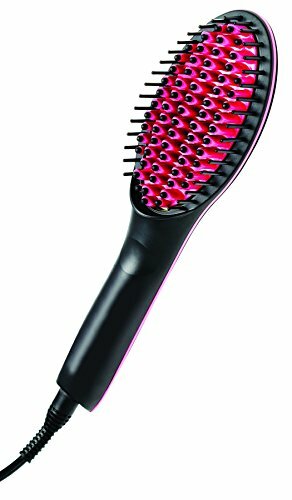 It was the very first straightening brush to be introduced and it is a top-rated product that has many positive reviews from users. Both brushes are designed to work with curly, frizzy, or wavy hair types. And they both do the job well. The main differences between Dafni and Simply Straight are the heat up time, and the quality of materials. The Dafni bush has a much faster heat up time, however the Simply Straight brush doesn’t take very long to heat up. They both take less time than most standard hair straighteners. The Dafni brush is well-crafted and can straighten hair quickly in just one pass. It features patented technology designed to guarantee that it is durable enough to last for years to come. While the Simply Straight brush may not have patented technology, both brushes feature bristles that are coated with ceramic material to distribute the heat evenly. Since the Dafni Straightening Brush represents an industry leading brand, it is more expensive than the Simply Straight Brush, yet it really doesn’t perform differently than the lower priced alternative. 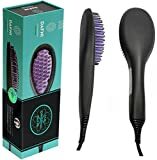 The Apalus straightening brush is around the same price as Simply Straight and the latest version features a change in the brush style, from oval shaped, to rectangular. Another main difference between these two brushes is the massage feature that the Apalus brush has that stimulates the scalp and helps to improve shine. Both brushes are made from the same materials, however the Apalus brush allows you to reach higher temperatures up to 446 degrees. It works well with coarse or thick hair, yet it is suitable for use with all hair types. The Apalus also features automatic shut-off and dual voltage for ease of use while traveling. When comparing these two products, you will find that they are very similar in durability, quality and features. If you have very thick or coarse hair, and often have trouble using a hair straightener because of your hair type, you may want to give the Apalus brush a try simply because it works better for those with thicker hair. The Asavea Straightening Brush is another affordable option for those looking to save money while purchasing a hair styling product. Both products look very similar, yet the Asavea brush is available in different colors. With the Asavea brush, the temperature is displayed in on an LED screen and can reach up to 446 degrees. It is a good option for those with thick hair. The cord rotates with makes it easy to use and it comes with a travel case. 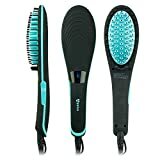 Since these products are so similar in features and price, either one would be a great purchase when you want an alternative to a standard hair straightener. After using the Simply Straight brush for ourselves, we have seen firsthand that it lives up to the hype. The straightening brush is easy to use, and it provided us with the results we expected. However, there are a few things to keep in mind before you throw out your traditional hair straightener and switch to Simply Straight. If you are looking for a quick alternative to a standard hair straightener that will help you style your hair on those busy mornings, this is a good product to try. But, if you are expecting to receive salon-quality results from this $ straightener, then you may be disappointed. While Simply Straight is easy to use and affordable, it does have a few disadvantages that some customers dislike. You are unable to tuck your hair underneath or flip it using the brush. And it is difficult to straighten each section from root to tip. It can provide you with a completely straight look and if that is the style you want to achieve; this product is the ideal alternative. However, it won’t get your hair as shiny as it would if you used a traditional hair straightener. The Simply Straight Ceramic Hair Straightener Brush can help take the stress out of your busy mornings. It has several great features that make it a great value for the price. This hair straightener can provide you with completely straight hair in less time and for less money. While there are some limitations with this product that make it less desirable for some users, especially those who have thin or short hair, the Simply Straight brush has proven to be one of the best affordable, alternative hair styling products currently available. The Simply Straight Ceramic Hair Straightener Brush is an electric, heated brush that will straighten all types of curly or wavy hair quickly and easily. You simply plug in the brush, turn it on, and adjust the temperature. Then allow the device to heat up the same as you would a standard straightener or curling iron. Also, Simply Straight is an affordable alternative to those expensive ceramic hair straighteners and it also costs much less than a trip to the salon.